During the Second World War, Soviet Premier Josef Stalin had asked America for Boeing B-29 Superfortresses through lend-lease but was rebuffed as the United States had correctly surmised that the allied status of the two countries might not survive the war and did not want to deliver the Americans’ most advanced bomber to the Soviet Union. Undeterred, Stalin set about having his agents find out all the information they could about the B-29 and tasked Andrey Tupolev (and Vladimir Myasishchev) with the job of designing an aeroplane that was the equal of the B-29 in capabilities; this project was known internally in the Tupolev OKB as the `64′. By the end of the Second World War, the only indigenous four-engined bomber design that the Soviets possessed was the obsolete Pe-8, though they also had a few Lancasters, B-17s and B-24s that had been abandoned by the Western Allies on Soviet soil and rebuilt to flying status, and the three B-29s that had been interned. Stalin recognised the need for a modern strategic bomber that was also capable of carrying the nuclear bomb then being developed, and directed Andrey Tupolev and Vladimir Myasishchev to develop such an aeroplane. The Tupolev aircraft was designated as the `64′, while the Myasishchev designs were designated as the `M-202′ (`DVB-202′) and `M-302′ (`DVB-302′). Before the fortuitous arrival of the three force-landed B-29s in the Soviet Far East, the Soviet Union, in the form of the Tupolev OKB, had begun development on a four-engined bomber that would have similar capabilities to the B-29. The Soviets first became aware of the Boeing B-29 Superfortress bomber in 1943, at about the same time that development of the Soviet nuclear weapon began. It was apparent that a new, capable bomber was needed to deliver this new weapon, so the Soviets, recognising the capabilities of the B- 29, set about creating a bomber of their own that mirrored its abilities. It was also at this time that the Tupolev OKB began developing the `64′ as just such a bomber. The OKB was directed in September 1943 to develop a mock-up and preliminary design for this high-altitude, long-range heavy bomber, which was to be powered by Shevtsov M-71TK-M engines. 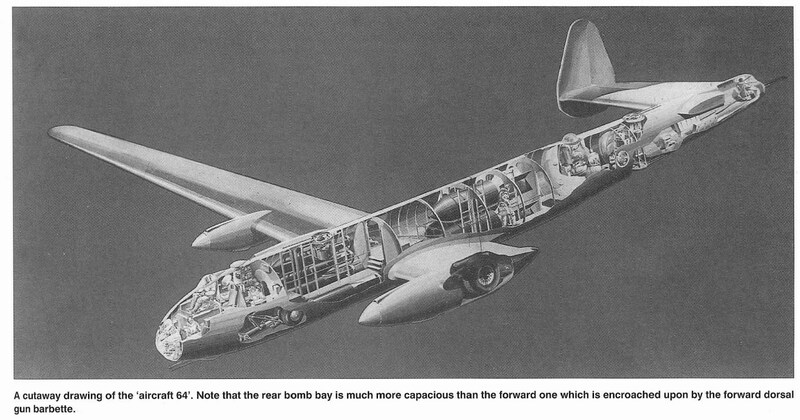 In addition, the bomber was to have remote-controlled turrets, and pressurised cabins, as with the B-29. This aircraft was to have the following specifications: a range of 3,107 miles (5,000 km) with a full bomb load of 22,046 lb (10,000 kg) at 249 mph (400 kph), a maximum speed of 311 mph at 32,808 feet (500 kph at 10,000 m), and a bomb bay capacity of 22,046 lb (10,000 kg). It was also to have a range of 3,728 miles (6,000 km) with a bomb load of 15,432 to 17,637 lb (7,000 to 8,000 kg). 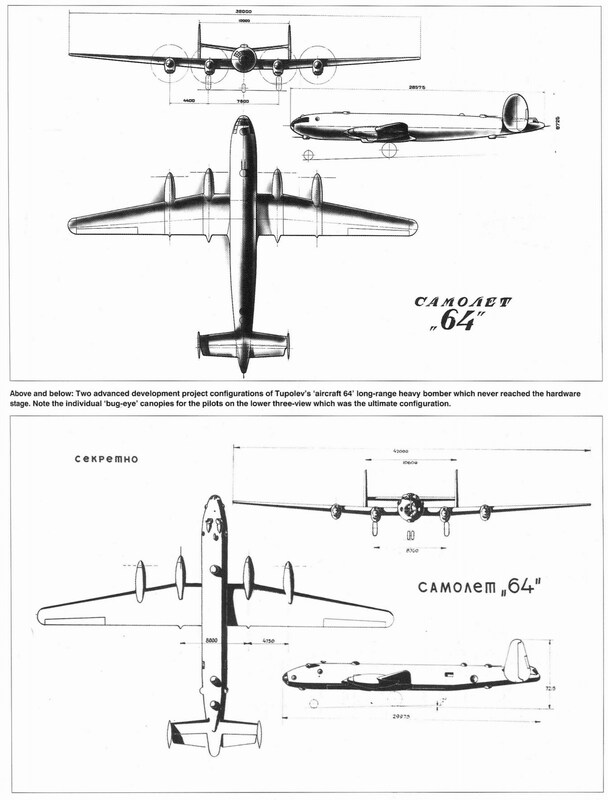 Drawing upon what he knew about the B-29 (and what Soviet spies were able to determine) and his own considerable engineering capabilities, by August 1944, Tupolev had readied the preliminary design of the Soviet B-29 `analogue’ (analogous in capability to the American B-29). Again, it was not to be a direct copy, but was to be capable of the same missions and with a similar overall performance. The aircraft was to be a long-range four-engined bomber capable of carrying a maximum bomb load of 39,683 lb (18,000 kg), with bombs of up to 11,023 lb (5,000 kg) in calibre. One can see that this bomb load was much greater than what had initially been called for-22,046 lb (10,000 kg). The pressurised cabins were to allow the crews to fly in comfort up to an altitude of 26,247 feet to 32,808 feet (8,000 m to 10,000 m). Defensive armament was to consist of turrets armed with either two or canopies mentioned previously, and 2,300 hp AM-46TK-3PB engines. The low-wing configuration would have made it easier to turn the aircraft into a passenger aircraft, but in the event, no version of the `64′ ever passed beyond the mock-up stage, as the reverse-engineering of the B-29 proved successful, rendering the `64′ redundant. This was the first of the Myasishchev OKB’s analogues to the B-29 and design work began in 1944. It is obvious from the extant drawings of the design that it drew heavily on what was known of the B-29, which the DVB- 202 very strongly resembled. 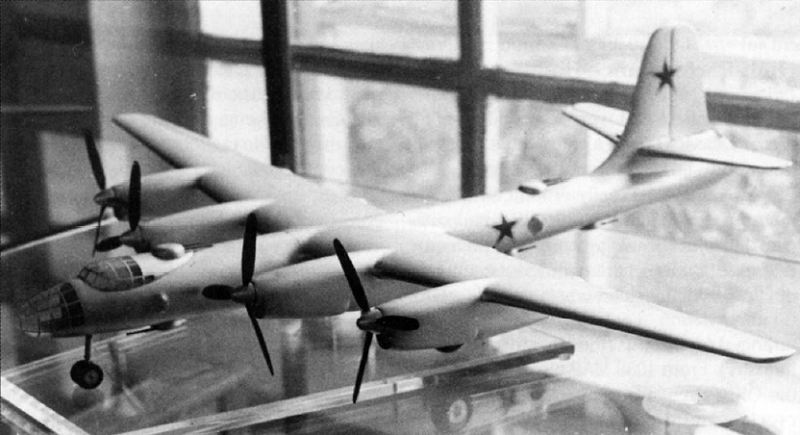 It also drew upon experience from Myasishchev’s earlier attempt at a modern long-range bomber, the DVB-102. Like the B-29 (and the Tu-4), the M-202 was to be a large, four-engined monoplane with a non-stepped flush cockpit, and a retractable tricycle landing gear. Again, as with the B-29, it featured a heavy defensive armament, in the form of four remote-controlled turrets and a manned tail turret. The first variant of the M-202 had the turrets arranged in the same way as the B-29, with two dorsal turrets fore and aft on the fuselage, two ventral turrets fore and aft on the fuselage, and a tail turret. Another variant had both of the dorsal turrets mounted in the forward fuselage, with the ventral turrets being mounted fore and aft, and a tail turret being included. The following specifications were issued for the M-202: a maximum speed of 373 mph at 32,808 feet (600 kph at 10,000 m), a ceiling of 39,370 feet (12,000 m), and a range of 3,728 miles (6,000 km) at a height of 32,808 feet (10,000 m) with a bomb load of 8,818 lb (4,000 kg). Development of the M-202 was stopped in favour of the improved M-302. 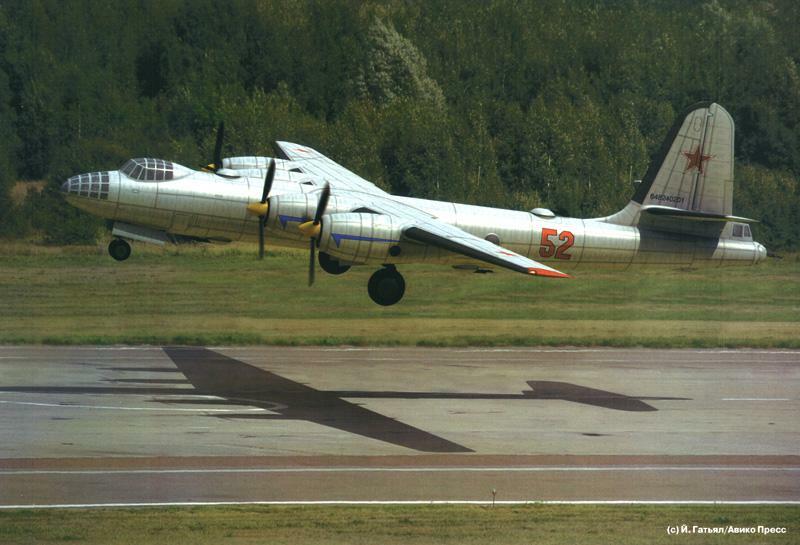 The second of Myasishchev’s B-29 analogues, it was a development of the M-202. Using the same basic layout of the M-202, the M-302 was designed to use four of the Shvetsov ASh-72TK turbo-charged radial engines. 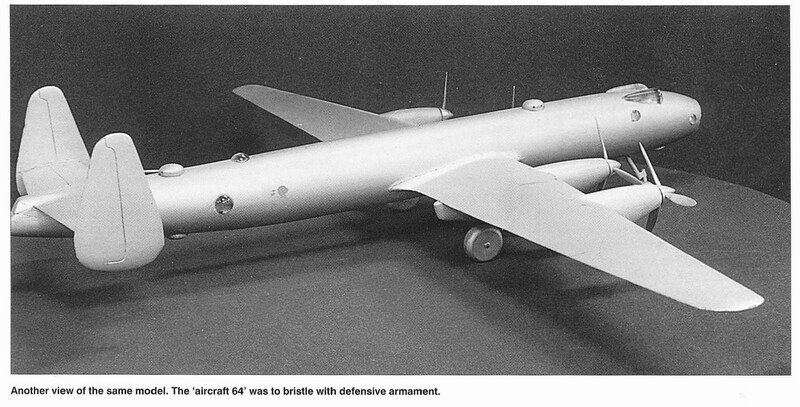 The M-302 lost out to the Tu-4 and was not proceeded with, even in prototype form. The DVB-402 was a development of the DVB-302 that had a raised cockpit, instead of the flush B-29-type cockpit. Likewise, it was not proceeded with.